Like most of the Cowichan Valley, Chemainus was the home of First Nations people for generations. After the Europeans arrived, the Scots, Germans, Chinese, Japanese and later, east Indians, came to work first in the mining, and later in the fishing and forestry industries. Now often called "the little town that did", Chemainus recreated itself in the 1980s after the sawmill, the town's main economic engine and employer, started to decline. 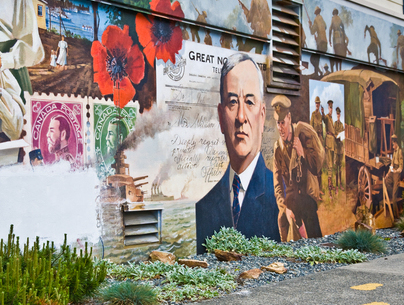 When the sawmill threatened closure, Chemainus citizens pulled together a plan to revitalize the town, cleaning it up and planning for Chemainus to become "the mural town". Over the next few years, historical murals were painted throughout the town, which gradually became an internationally known public art project. Twenty-five years later, the town still attracts over 40,000 visitors each year to see the murals documenting the history of the area. Tourism has become the major industry of the town. Residents and visitors now find themselves in a cultural environment that is exhilarating and vibrant. The Chemainus Theatre Festival presents classical and modern award winning theatre and runs the gourmet Playbill Dining Room. Other restaurants and coffee shops thrive on the hustle and bustle of the tourist influx. Twisted Sisters Tea Room has acoustic jams and movies while serving desserts and tea, and the Waterwheel Park is the area's venue for outdoor concerts, markets and sing-alongs. The Wednesday Evening Market takes place all summer long at Waterwheel Park. In terms of shopping, boutiques and art stores are on hand, as well as the regular grocery stores, drugstores, bakeries, pubs, thrift store and bookstores. Restaurants offer Japanese, Chinese, Vietnamese, Mediterranean and European cuisine. Other activities include swimming at Kin Beach or Fuller Lake, hiking at Chemainus Lake or the Askew Creek Wilderness Trail, and paddling by kayak on the Chemainus and Crofton waterfronts. Golfing is available at the Mount Brenton Golf Course. A ferry goes from Chemainus to Thetis Island a minimum of 10 times a day. Located about 45 minutes drive south from Nanaimo, or 20 minutes north from Duncan, Chemainus is conveniently located between Victoria, Nanaimo and the Gulf Islands. The Nanaimo Airport, with flights coming in and out from Vancouver several times a day, is reasonably close. The E&N Railway stops in Chemainus on its way south to Victoria or north to Courtenay. Greyhound Buses pick up people traveling between local towns 5 or 6 times a day. Chemainus is served by the Cowichan Valley Regional Transit System.